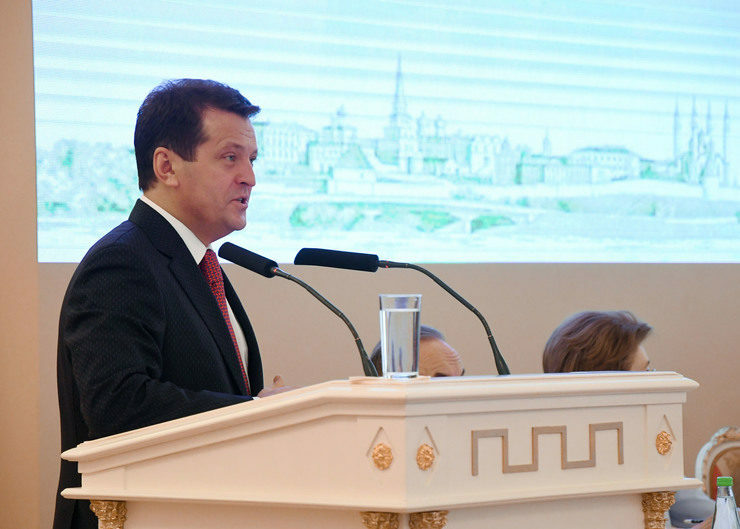 Ilsur Metshin: "It will be not enough of the whole TV program for listing all the plans for the development of Kazan"
Ilsur Metshin: "Rubin" will be happy to give victory to our fans and ... Berdiev"
I. Metshin: "We listen to Kazan residents carefully and try to answer their activity"
I. Metshin: "We must be bold to imagine what Kazan in 2030 will be"
I. Metshin: "View of each Kazan resident is important for the development of the "Strategy-2030"
Ilsur Metshin: “It is much quieter in our bay called "Kazan"
In September Kazan once again will become the center of attention of the international community - this time in terms of architecture. 10 international architectural teams from Russia, France, Italy, Spain, the Netherlands, Great Britain and China - finalists of the Open competition for the development of the concept of the embankments of Kaban lakes will protect their works. Total 164 bids from 12 countries for participation in the competition were received, 65 of them have passed the technical expertise and were considered at the meeting of the jury. The shores of Kaban lakes system are almost 10 kilometers of unequipped urban area, so the winner, who will receive a million rubles and a contract to develop a design project, will have place to create. And it is now clear that the keynote of each work will be green-design and green-development. Why now Kazan decided to concentrate efforts on the regeneration of parks and waterfronts, what else is in plans of the city authorities and what can hinder the implementation of these plans? Mayor Ilsur Metshin gives answers to the question to radio station «Business FM» in an exclusive interview. The city's economy: what you had to give up in the new economy situation? Or maybe it was not necessary? I.M. : Thank God, we have not refused practically from nothing. Maybe we had give up on some plans, which are always a little more than opportunities, but all social programs even in the most difficult conditions (I mean the end of last year and beginning of this) - all social programs, both federal and republican, are implemented on Kazan territory. Moreover, the first time in the history of the new Russia, and even the former Soviet Union we met FINA World Cup, which gathered nearly 190 countries! This required additional effort and more implementation of various infrastructure projects. So we have nothing to complain - we have not given up on anything, only rooted new projects. I understand that it is unlikely you could afford to refuse to comply with social obligations, including those related to the championship. And in terms of business projects: really nothing has changed? I.M. : Let’s start with hot: on the eve of the championship we had to manage not only with the daily work, but to fulfill that was aimed at receiving a large number of guests - only in the championship we were expecting about 100 thousand of tourists. We met with restaurateurs, hoteliers, representatives of all service industries. Of course, over the last three years thanks to the Universiade and the World Cup, we grew on 88 hotels and hostels: now we have 158 of them, it is easy to calculate that we became more than twice bigger. It points to the investment attractiveness of Kazan and how our small and medium businesses develop: after all hostels and hotels are mostly small businesses. And if you compare our hoteliers with their "brothers in arms" in other cities, in Moscow, for example, it appears we are riding high. And the index of industrial production on the results of the past six months is 104.7%. That is not the emotions, but statistics say that in comparison with other cities we feel pretty good. Short-term rating was affirmed at the level of ‘stable’, even in the republic itself somewhat is worse, I'm not talking about major cities. Therefore, my inner feeling as the mayor is that Kazan is developing steadily. It would be unfair to claim that there is no crisis, but again - all in comparison. There is decline by hotel occupancy in the absence of the championships, decline of an average check in the restaurants - but the fall in other cities and in the fall of Kazan are very different. We get our head above water, our business representatives do it difficultly, but they service the loans, pay interest, take new loans, implement new projects, so it is early to speak, that we are the serene harbor, but in our bay called "Kazan" is much quieter than anywhere else. Do you have three main explanations why Kazan stands out so happily against the background? I.M. : It’s hard to name three, but I'll try. First is a system, stable work and the continuity of power for decades. Probably it’s more correct to take the period after the collapse of the USSR, when the regions were left to themselves and had to choose their path of development. Beginning with the first President Mintimer Shaimiev and now, with the current president Rustam Minnikhanov, major resources are concentrated in the hands of the Republic. These are "Tatneft", the largest plants of chemistry, petro chemistry, and mechanical engineering. At the time when we were offered: "Take as much sovereignty as necessary", we took just enough to be masters of the situation and to make decisions. The second is a hard-working, well-educated, very tolerant people, who used to live in friendship and good-neighborliness for centuries. It's not just words: look at our mosques, churches, synagogues, temples, that lived in friendship for centuries, not divided into "your" and "our." We are the city of big science; we have the second after Moscow, founded by Emperor Alexander I University, which determined the development of the whole science for two centuries ahead. And the third is the fact that Kazan was born under a lucky star, in a sense of very good geographic location, that we are in the middle of the Silk Road, and in the middle of road traffic, air and water communications. Since the beginning of the new round of crisis in Moscow they start seriously thinking about attracting new investment strength of the interaction with the business already represented in the metropolitan area. And much has been done to the extent that, Moscow has developed a special law for the investors, within which it is ready to take on all the risks of non-economic nature. What is the situation with the investment climate in Kazan? Are you taking any extra efforts to attract investors - both our and foreign? I.M. : Investment climate ... There it is correct appeal to the official rating. And they say that Tatarstan and Kazan are among the leaders in the Russian Federation on the ease of doing business. Another thing, if you ask me the question: can it be better? Of course, we can and should do more in this direction. We, I mean the authority (investors and residents do not always share the power of the municipal, republican, federal - we are power in one person for them), and so, we are lagging behind in terms of legislation. In the territory of the whole country should be more guarantees and clear commitment from the government. In Tatarstan we used to cherish what is called a merchant word: you give your word, shake hands – and it's more than some kind of agreement on paper. And then - our tremendous efforts, our ability to walk between the rains; in this case the rain is the adoption of one or the other law, which often excludes some other regulations. And here we are far from England, where nothing has changed for 200 years. Today we have one, tomorrow another, the day after the third, and all that is difficult to explain, especially to foreign investors. As for the investors in this regard we, in comparison with other regions, look better in terms of the statistics, but of course, we did not became a Silicon Valley yet. And we would like to become. I.M. : Well, it's not so sad. In anticipation of a conversation with you I had a meeting with group of foreign companies - we talk on the implementation of a large construction project, where will be a residential complex, trade center, meeting room, and catering. This is serious enough project in terms of the money and the volume of investment option. Yes, today we talk somehow on fingers, somehow on agreements, but we don’t have such pattern as in the traffic police... We have not yet such transparent conditions, so you have to be engaged personally in each project, conduct it, fix responsibility deputies, gather periodically to control and to see, how our agreements are accomplished. Probably, the results of import substitution don’t grow swiftly and in abundance, it takes time. And I'm sure that the saying that “every cloud has a silver lining” will work this time again. That's a fresh example of the Kazan Helicopter Plant, which had to take the paint from Holland before; for sanctions they stopped giving it to us, so our chemists, our production workers have developed counterpart not only adapted to modern conditions - the paint has turned out of such quality that after some time we can compete with the Dutch in the global open market easily! Of course, not all segments are covered now, but concrete examples of import substitution took place in Kazan - I cannot bend the fingers of one hand to calculate this. "Moscow - Kazan" high-speed road, which we are building or not building. We have confused ourselves, what we are doing with it today. From the point of view not the image, but the economy – do you need this road? And why do you need it? Are you ready to take on the costs of its construction in a certain part of your budget, and most importantly, for the following supplies? I.M. : In the well-known tale of Saint-Exupery Little Prince said that all roads lead to the people. Today we have eight trains to Moscow; however, they cannot cope with traffic. In any case the road will accelerate the movement, the road is the development of business, is the exchange of human resources. Of course, I think about this a little cautiously - what if our human resources will rush for big money. But applying the strictest criteria I understand - our people won’t leave anywhere. So for us high-speed road is a convenient mean of communication, when in a little over three hours we could get to Moscow. And all will come to life along this road: settlements and auto roads. Today exchange in the country - both with human resources and commodities - unfortunately does not correspond to the rhythm of life that the business sets: some raw materials can come late, some parts, equipment and so do not have time to reach the right place. Speedway is just a different quality of business life, which the capital and in all regions located along the high-speed line will have. Very romantic, but I am ready to argue with you. Here branch "Moscow - Nizhny Novgorod" was built with “Sapsan" - it is unprofitable, and now it is not very clear what to do with it. Another example is Sochi with its equally unprofitable "Swallows". Are you really sincerely believe that Kazan require additional expenditure to share human resources with Moscow? I.M. : Let me see, such projects are not paying off in 3-5 years by definition! Here the financial model is for decades - for 25 or 30 years. If we look at this way - we have built in Sochi and it is not profitable in a year, or we have built it in Nizhny and two years later there is no financial result - it is absolutely wrong: here the planning horizon is completely different. Therefore, to assess here and now is short-sightedness, we must look further and bolder. If there is no such a communication in a country like Russia, it means that we are going to continue to be a village which is associated only with pigeon mail and cartage. We are the great power that launched the first human into space, why cannot we build a high-speed line from the Far East to Kaliningrad? Do not forget, we cannot stay in yesterday; it should be planning for the future. About the prospects: today you are going to make rather serious, almost a radical and very costly restructuring of Kazan - why? Is it really necessary to change the appearance of the city? And specifically, competition for the arrangement of the lakeside promenade of Kaban lake - do you really need it? I.M. : You know, some 7 years ago, when we made a decision on capital repair of housing, my headache as the mayor was a quarter of idle elevators that have served 25, 27, 28 years. And we thought with horror: how will we change it, it would not be enough money! The same with roofs, entrances, with communications. Today, we have grown to the point that 35% of the total housing stock of Kazan has been repaired. In fact, we came here to get acquainted with the competition on the embankments of Kazan. With the arrival of Natalia Fishman for the post of Assistant to the President of the Republic of Tatarstan, Kazan is connected with an active position to change the appearance of the city. Tell us about it. Kazan is so beautiful, so well, so pretty after all the latest developments - and suddenly you're up to this quite dramatically, costly restructuring. What for? I.M. : Invitation of Natalia is a personal initiative of the President. We try not to reinvent the wheel, but to do something new with those who already have a successful experience. We are never ashamed to learn from the professionals. If in 2007 I was told that after 7 years we will think about public spaces - I would, of course, replied that it won’t happen in my life, and it is unlikely that my children will see it. But over the years we have come to the yards, where the annual cost of implementing of the program is by 500 million rubles: the yards were, as they say, “dead” - no benches, no tracks, sometimes even without lighting. We brought them in order - and already 250 thousand of Kazan residents felt it themselves. And now people are already demanding more! It is good that that's the way the world wags – today we always want better than yesterday; I like it, as the mayor these requirements only please me: it spurs all of us to work and to make the city better. And so the idea of ​​competition on the concept of development of the embankments was born, the society is ripe for this, the authority in the person of the president, the government and the city also came to this consciously. We understand that it's hard, almost prohibitive bar, and we are not prepared a tidy sum for the implementation of these projects. But about money ... I've never remember that for 18 years as I am the mayor we knew that we have the money for it at a hundred percent when starting something. But there is a great desire - it is a lot. And what plans in connection with these desires are? Share for what you want to pay special attention. I.M. : First, Kazan is standing on the water for a thousand years, but the last ... let's say, after the revolution years - our problem is the lack of embankments. Volga is severed with railways and industrial river port. And Kazanka too, because of lack of funds, desires, and something else, some objective and subjective reasons, was also without embankments. On behalf of the President, we are working with our colleagues to develop and to make the embankment of the Volga River from the port to the crosswalk, which will link to Kazanka embankments. For the competition on the concept of quays we received 165 applications, of which 27 are from international companies, which want to equip the public space: embankments, parks, squares, communications, cycle paths, footpaths along our famous mysterious lake Kaban. Yet in the focus is the green framework of the city. If before we planted trees where there was an empty space, now we have declared a Year of parks and gardens - in the future we want to see in Kazan "cascade" of embankments, parks and forests. A stone city should become a garden city. To build new houses, to fill Kazan with objects of social and business infrastructure is, of course, also important, but still I would like to warm the city with green slippers. Today phrase “the power turned its face to the business” is a very common. I do not know what it had been turned with before, but today - with its face exactly. What are the relationships between the city and business in Kazan? Let's take a concrete question, real estate development business: with what your builders come to you more often, and in what are you accommodate them? I.M. : Our relations last for over 10 years - this year, in November, will be 10 years as I headed the city. Our first meetings with developers were hard: we just took as a basis the experience of Moscow, starting with simple things – for example, a carwash should be at every construction site. They looked at me as I was crazy – what a car wash, we lived just like that for a lifetime, and it is construction site and there is a mud here! What is this, a pharmacy or surgical ward? We say, well, we cannot carry the dirt of the city, we have an active city in which many things are building, and not only a wash should be at a site, but a single style of the fence! Oh, right, it was hard. Then we were said that there will be no residential building without underground parking. They ran to complain up to Shaimiev: "He will stop the construction! .. It is much more expensive! ..". Eventually we proved on the figures that the rise of expenses was non-lethal, and the current motorization showed that if we haven’t imposed this rule 10 years ago - what would be today with Kazan? No interchanges, no parkings would be enough. That is where we started. Today we consider each investment project, almost every house in City-planning Council, much larger residential complexes we discuss even with the participation of our colleagues from the government - because it's accessibility, it is social facilities, is the load on the water utility, electric networks. We present a lot of things to our President - and not only architectural but also socio-spatial solutions. Fortunately, developers are now in dialogue - with our Kazan ones we succeed exactly. Foreign, including the Turkish developers, come and they have something to bring, Moscow companies come. And we are building tomorrow's Kazan in the dialogue, though not always easy. Ilsur Metshin: "We intend to occupy the niche of the most comfortable city in Russia"
The "City of Kazan KZN.RU" news agency is responsible for the content and support of the mayor of Kazan website. Any materials of the mayor of Kazan website may be reproduced in the mass media, on the Internetservers or by any other means without any restrictions as to the volume and timing of publication on thecondition that they are credited to the original source (an interactive link is required in the case of copyingportal information on the Internet). No prior permission for reprints by the "City of Kazan KZN.RU" news agency or by the mayor of Kazan press office is required. The web-site www.metshin.ru has been created to give you an opportunity to be aware of the numerous events occurring in the most different spheres of the city life, to express your opinion on hot topics (contemporary issues) for you and other citizens, as well as to ask questions using Internet reception in the online mode. Sincerely, I hope that taking common efforts we will make the capital of our republic better, more comfortable, and life of citizens more stable and happy. In this section, you will see "tieless" Ilsur Metshin – not only as the mayor of Kazan, but also as a lover of sports and music, husband and father. Here you can learn about his opinions on various topics relevant to Kazan and get recommendations on books to read, movies to watch and places to visit.